All our Hamburdehesas are distinguished by their allergen-free meat, exquisite flavour, superior quality and extraordinary juiciness. The secret of our hamburgers lies in how the livestock is raised. 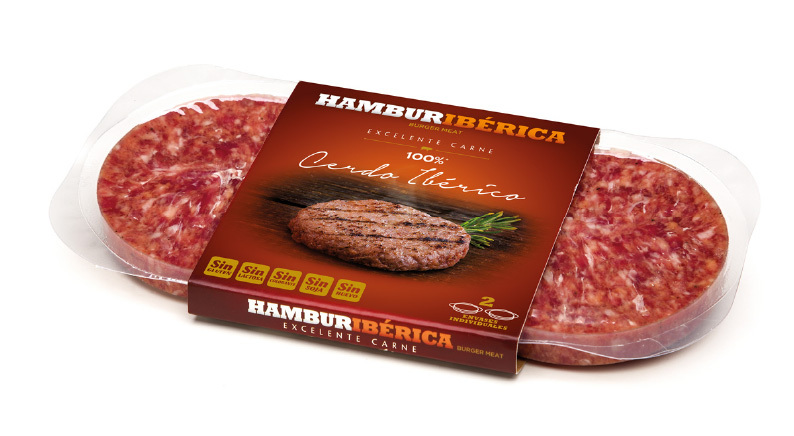 The meat comes from heifers raised free on the dehesa and fed with their mothers’ milk and 100% natural vegetable animal feed and cereals. This method produces excellent beef from the Retinta and Angus breeds for the most discerning palates. And the classic Iberian pork from free-range Iberian stock that live beneath cork oaks and holm oaks and feed on acorns. The hamburger for the most demanding connoisseur who also wants a healthy diet. 100% solely and exclusively beef. Suitable for all ages. Sulphite-free. Free of preservatives, additives, colourings, gluten, lactose, soy and egg. Made from the best pieces of our dehesa-raised heifers including the sirloin. Two individual packs. Our flagship hamburger. 100% authentic meat from heifers raised on the dehesa. Made with olive oil. Enjoy all its flavour with an energy value of 130 kilocalories and less than 5% fat. They come in individual bipacks. For those who want more. 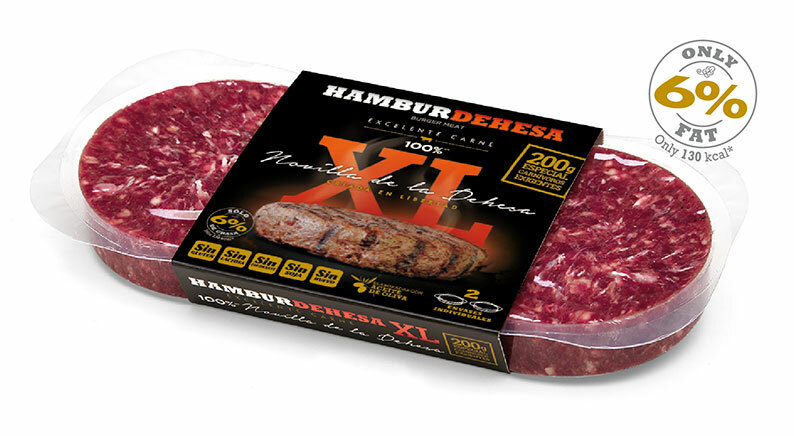 Exquisite meat from heifers raised on the dehesa in XL format. Excellent nutritional properties with less than 5% fat and made with olive oil. Maximum flavour in a bigger size: 200 grams. They come in individual bipacks. 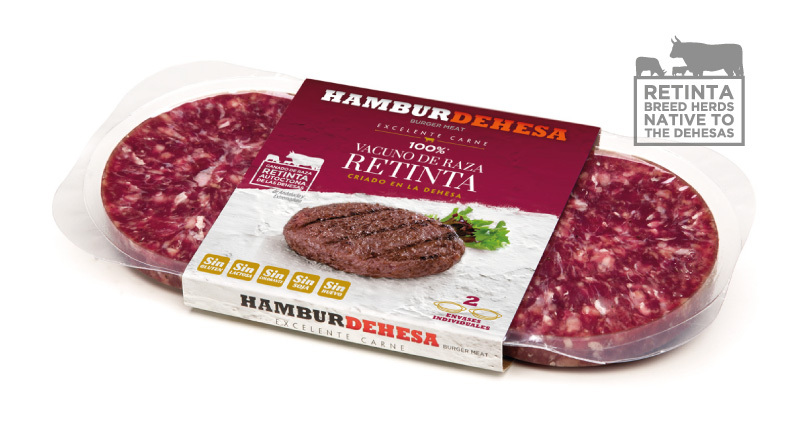 Exclusive beef from Retinta breed livestock native to southwestern Spain with excellent organoleptic qualities. The most select meat from the dehesa, presented in individual bipacks. For lovers of Angus breed meat. This hamburger stands out for its intense flavour, excellent texture and its extraordinary juiciness. It contains a large quantity of unsaturated fat, which means that it is low in cholesterol. Comes in two individual packs. Our traditional, high-quality fresh Iberian meat, tasty and healthy. This hamburger is highly appreciated by gourmet palates due to its outstanding juiciness. Available in individual bipacks.